We’d love your help. Let us know what’s wrong with this preview of Speak, Lord by Vic Black. To ask other readers questions about Speak, Lord, please sign up. It took me a long time to read this because this isn't a "reading" book. It's a book that inspires thoughtful reflection as you read and engage with the Psalms. Each of the 19 chapters features a Psalm, first in the normal form and then rewritten as if God were speaking the words to you. And that's the key: that we're to listen to God's voice. Ideally you would then time to meditate and write your own version; I haven't done this yet, but I think it would be a wonderful way to study the Psalms i It took me a long time to read this because this isn't a "reading" book. It's a book that inspires thoughtful reflection as you read and engage with the Psalms. Each of the 19 chapters features a Psalm, first in the normal form and then rewritten as if God were speaking the words to you. And that's the key: that we're to listen to God's voice. Ideally you would then time to meditate and write your own version; I haven't done this yet, but I think it would be a wonderful way to study the Psalms in a small group setting. The author's explanation of his thought process, and the way he brought in aspects from multiple translations - and even other areas of the Bible - also helped me to think about each Psalm more carefully, not just reading the words but noticing the literary (or song-writing) techniques used, and unpacking even those I typically do not linger over. Everything here is about reading, contemplating, reworking, until you have something that's uniquely personalized for you and as different from the original as the Amplified is from the King James. I first noticed it had affected me more than I knew when I found myself using the techniques taught here in another study, and realized that even without doing any of the writing I'm already discovering more of God's voice when I read Scripture. I'd like to rewrite one of the less-familiar Psalms as a personal retreat one day, and the writing prompts for each chapter will be a great palce to start. Vic Black, National Prayer Director for the Navigators, invites his readers to hear the psalms in the first person, with God as the speaker and the believer as a much-beloved listener. In the foreword, Eugene Peterson ties this concept to God’s dealings with Moses in the Old Testament. The name that God spoke from the burning bush revealed God as both present and personal: “YHWH — I AM THAT I AM.” Jesus spoke with this same personal, first-person voice, self-identifying as “I AM” seven times in John’s Gospel. Therefore, listening for God’s voice in the psalms, hearing His Words in first person, is more than just re-writing Scripture. It is an affirmation of the intimate relationship to be enjoyed between God and His child. Personalizing the psalms is a meditative exercise which is, at the same time, a roll-up-your-sleeves, haul- out-multiple-Bible-translations, and-dig-for-truth project. Vic recommends a journaling approach, pondering the question, “Lord, what might it sound like if You spoke this psalm to me personally?” This involves trusting the Holy Spirit to bring other Scriptures to mind that will shed light on the current psalm. By focusing on one psalm for an entire week, I was able to wait, to listen, and to soak in that one psalm’s truth. Speak, Lord examines over twenty psalms, providing the full text to begin the process, then analyzing the chapter for the theme and most important thoughts. Vic Black’s first-person expression of each psalm follows and then a reflection which captures additional insights that occurred to Vic in his study and meditation. Each chapter leaves the door wide open for reader input with prompts and tips for journaling the psalm in first person. “Let the word of Christ dwell in you richly in all wisdom . . .,” said Paul, meaning the inspired Scriptures, the word of revelation Christ brought into the world. Speak, Lord is an invitation to this abundant, extravagant saturation, a guide to slowing down and allowing God to speak for Himself through his Word. Lord, what would it sound like if You spoke this psalm to me personally? Speak Lord takes 19 different chapters of Psalms and redirects you to listen personally to the voice of God. This is not an attempt to re-write scripture which I am always wary about when reading a type of book like this. It keeps with the integrity of the word while opening your heart to God revealing himself to you. It is an encouragement for you to enjoy God and to expose you to how much God enjoys you. The layout of each Lord, what would it sound like if You spoke this psalm to me personally? The layout of each chapter starts with a Psalm has it is written in the word. Each chapter has a different bible version and the author encourages you to look at many versions to gleam more insight to the passage. The passage then is re-written in a first person perspective followed by a practice section with writing prompts followed by devotional thoughts for you to consider. An example of one of my favorite one first person perspective. I am Jehovah, the One who fights for you, I deliver you, I save you from your vicious enemies. I shine and you can see. I rescue and you are safe. Fear no one. Fear nothing. What would you compare to Me that is worthy of fear? …despite pending battle, put your confidence in Me. I hear your solitary heart cry. You do not lust for many things. You are hungering for Me! And I will satisfy your longing. I will meet your deepest need. I am pleased that you want to move into My House. …I said to you Seek My Face! You heart responded in My presence. Your face, O God I will seek! Even though you have known me tenderly, still you fear My face turning away. You fear My rejection. I will not abandon you. Quite the contrary I am your deliverer! I rescue! I break chains! I open prison doors. I enjoyed my time with the Lord on this read and I think you will too! A Special Thank You to Tyndale House Publishers and Netgalley for the ARC and the opportunity to post an honest review. 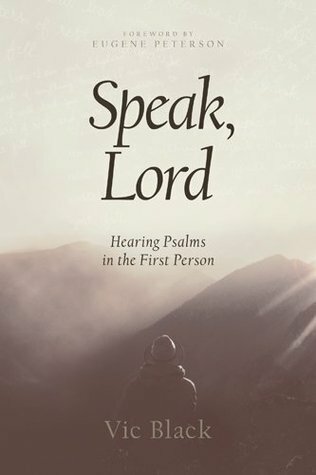 Speak Lord by Vic Black is a book that provides the reader the opportunity to experience the Bible's Psalms personally. The author writes the Psalms so the reader can read/hear them in the First person narrative, making their message more direct and meaningful. The messages relayed in this book are strong, vibrant and motivational!